Plasterboard suspended ceiling systems are often used in the design of residential and office space. 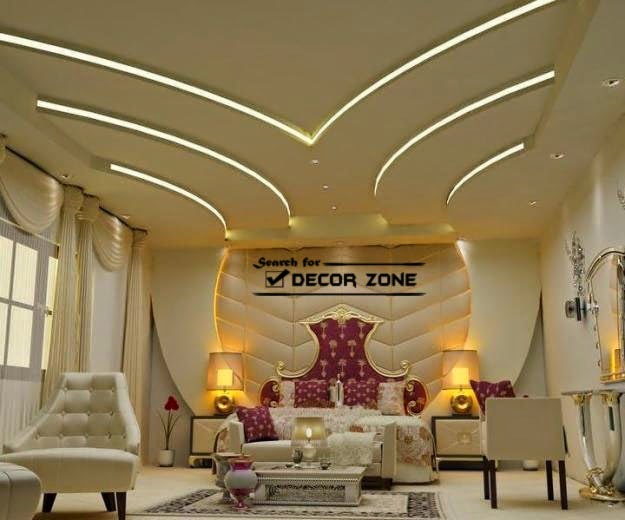 Universality of the system design, as well as the short time that the installation of plasterboard suspended ceilings take makes it undisputed leader in sales of finishing materials. 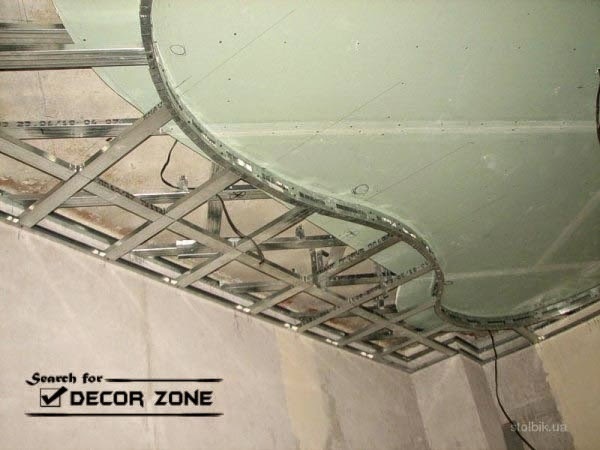 suspended ceiling systems of plaster are mounted on a frame made of light galvanized metal profiles of various designs: Guiding profiles - UD; Support profiles - CD. Bearing metal structures attached at some distance from the ceiling . gypsum board ceiling pendant mounted on a five - twenty-five centimeters from a ceiling. Width of the gap is due to utilities and wiring layout design. Step between the bearing profiles crates must be sixty centimeters - the standard width of the sheet of drywall. Guiding profiles are attached along the perimeter metal dowels. Suspended ceiling plasterboard mounted on bearing metal profiles, mounted on rails through the perforated metal hangers. Suspensions are mounted to the supporting profiles in steps of one meter. It is important to precisely fix guides carrier crates. To do this, use a plumb line and spirit level. Straight line for mounting on walls kicking using colored thread strung along the wall is level. 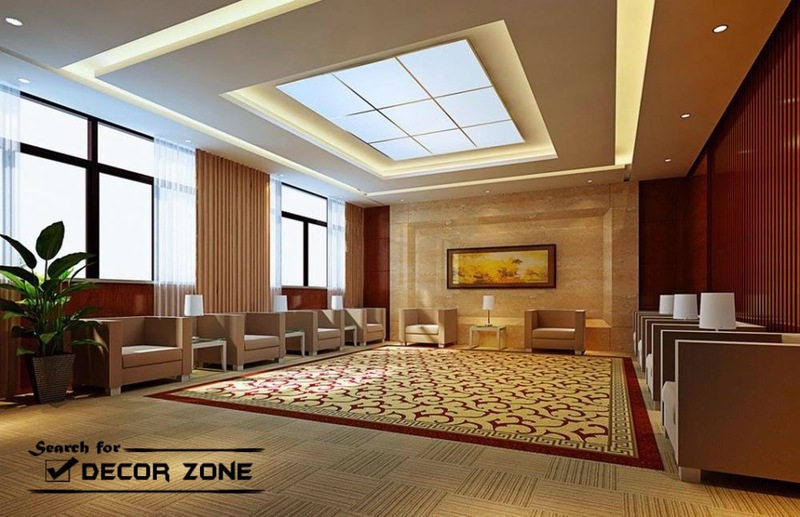 Aligning the suspended ceiling should start from the highest corner of the room. Mounted on a metal frame by means of screws on metal mounted plasterboard. Installation of sheet made from wall to center on bearing profiles. Step mounting screws - 25 centimeters. It is important that the screws were not deeply recessed into the drywall and painting do not protrude above the surface. Because the attachment will be seen in subsequent plastering surface. After installation of plasterboard on the metal frame of the suspended ceiling system you should wipe all irregularities sandpaper. And strengthen the seams with a special masking grid and plaster . After drying is carried out starting plaster coating. Installing plasterboard suspended ceiling is essential to eliminate all irregularities in the ceiling, as well as to make sure that the cap screws do not protrude above the surface. Grouting should be carried out at a temperature of not lower than 10 degrees and maintain the same indoor humidity to dry putty. This is at least two days. If you do not meet this condition, the sheets of drywall may be warped and deformed. Plasterboard suspended ceiling can be classically white and smooth, and performed in a wide variety of combinatorial solutions. Also suspended ceiling systems of plasterboard can be finished by very diverse materials: Paper; Paint; Ceramic tiles; Mirrors; Decorative filler. 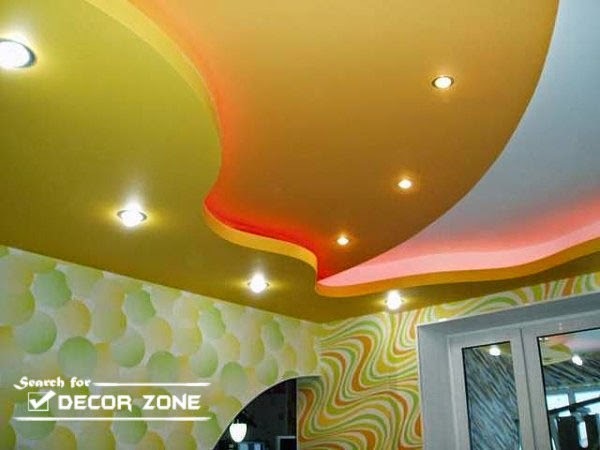 suspended ceilings that made of plasterboard look stylish and modern with different finish textures that visually can increase or decrease the space. 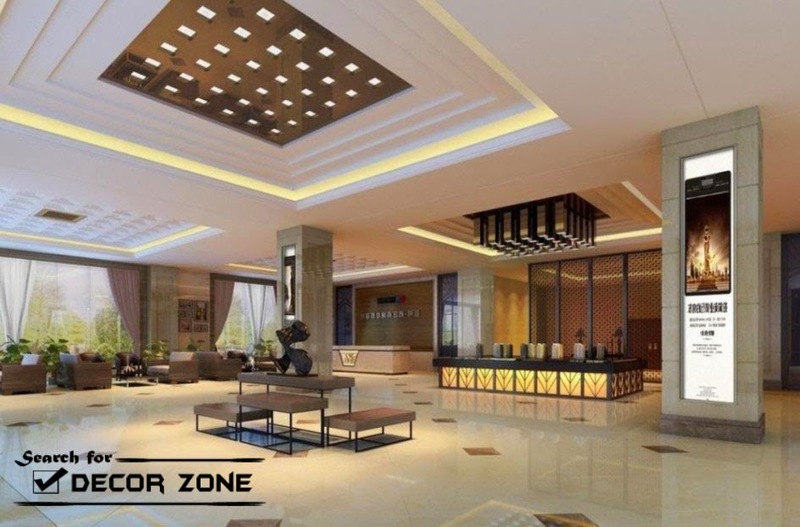 Construction of suspended ceilings can have different shapes and design options, then performing a stylish and original interior design is not difficult.